Master, the no. 1 male face care brand for men, is giving lucky Filipino hoops fans a chance to fly to Spain, all-expenses-paid, to watch live the Gilas Pilipinas national men’s basketball team put their oil-free game faces on at the 2014 FIBA Basketball World Cup. “Being a basketball-crazy country, we Filipinos are proud to qualify for the FIBA World Championships. Through Master Goes to Spain Promo, lucky fans will have the chance of their lives to fly to Spain to support our basketball heroes and watch them battle and put their oil-free game faces on against some of the world’s best teams.” said Jonathan Pua, Unilever Male Grooming brand manager. Included in the Gilas Team lineup is Master lead endorser Marc Pingris. Other members of the Gilas Team who are vying for basketball glory are Jimmy Alapag, LA Tenorio, Jayson Castro, Larry Fonacier, Jeff Chan, Gabe Norwood, Gary David, Ranidel de Ocampo, Japeth Aguilar, Junemar Fajardo, Beau Belga, Greg Slaughter, Marcio Lassiter, Jared Dillinger, Paul Lee and naturalized player Marcus Douthit. Coach Chot Reyes’ team will be pitting skills against world power houses such as USA, Spain, Argentina, Brazil, Russia and other world class basketball teams. To join the Master Game Face Goes to Spain promo, simply buy a Master Facial Wash or Deep Cleanser with the special promo sticker, scratch the sticker to see the special promo code, text MasterSPAIN and send to 5656. Hundreds of instant prizes like tumblers, towels and jerseys are also up for grabs aside from the grand prize all-expense paid trips to Spain for 5 lucky winners. Boosting anti-oil protection, Master Oil Control Max Facial Wash has the revolutionary Cooling ZEROIL formula so you can get 8 hours of no oil for that fresh game face look to bring out the best in anyone’s game on and off the court. Get 8 hours of no oil with Master Facial Wash so you can put your game face on! You can also fight deep seated dirt that causes pimples with Master Oil Control Max Deep Cleanser. 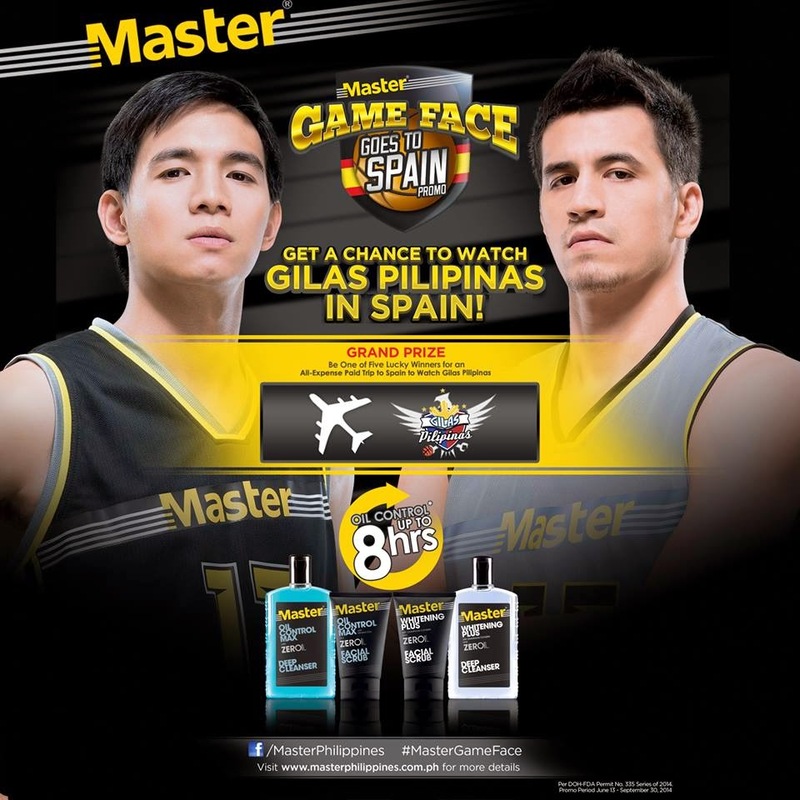 For more details about Master products and the Master Game Face Goes to Spain promo, visit www.MasterPhilippines.com.ph and facebook.com/MasterPhilippines. Follow Master on Twitter and Instagram @MasterGameFace to find out more.